Rigstar’s VoIP solution provides a one-stop communication service for small and large businesses. Our cloud-based phone system is fully redundant and feature rich that supports a number of SIP compliant phones. The Management Portal offers advanced features and settings to the end client, allowing for full visibility into the call activity and users within the organization. The user portal provides additional customization to seamlessly manage messages, contacts, call history and forwarding to any smart device. 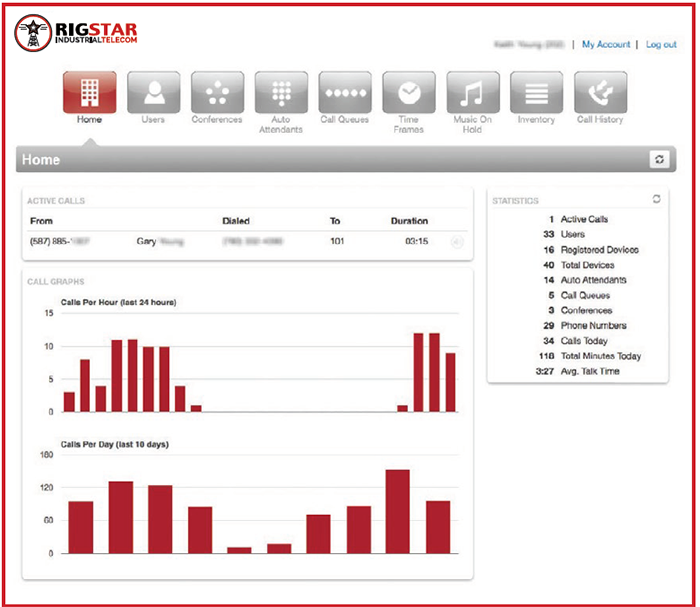 Users of our cloud-based VoIP system have the option to use their existing IP phone or purchase one through Rigstar. Once the phone is programmed, simply plug it into the nearest LAN port. Then, the IP phone registers automatically with the VoIP system. The IP phone always keeps its number, and operates exactly the same way, no matter where you plug it in – on your desk, in the office next door or in another country. IP phone systems are traditionally built on standard PC or embedded hardware which are considered more cost-effective and powerful than the hardware of a traditional phone system. At the same time, IP phone systems are scalable, as they are not limited to a certain number of physical phone ports. That means you don’t need to replace your phone system when your company grows, simply purchase another phone and add it to the system.